This is my tulpa. Her name is Sari. I've almost completely finished the visualization steps. Now working on olfactory and tactile response. 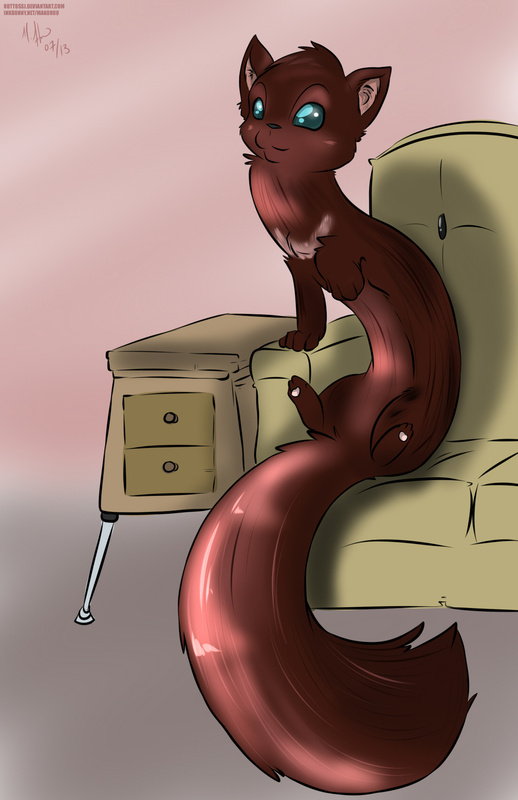 I love floofy tails. Looks awesome and great job! I love floofy tails, too! She seems about 5 feet long and 3 feet tall. Yeah she was really big at first. I drew her too big in this photo. She's gotten smaller now, though. About half this size. Dohmygawd. Can I hug it? If you ask nicely she might let you hug her. Do you know what a tulpa is? .-. *Her If you ask nicely she might let you hug her. Do you know what a tulpa is? .-. *asks her* May I please hug you? Er... No. What's a Tulpa? My apologies. I would love to hug her and lick her little Pawsies~ *asks her* May I please hug you? This man wants to give you a hug, Sari. Okay... What does Tulpa have to do with this? *gives her a big, warm typhlosion hug* n... No paw pads? :c but why? The being in this picture IS my tulpa. Your thoughts materialized through will power? :c is that why there's no licking her foot pads? But I have other characters for whom foot pad licking may be allowed. Yeap. ;3 Sorry friend. But I have other characters for whom foot pad licking may be allowed. You've clearly never been to my gallery. I have, I just watch a lot of people ^_^"
90% of my art is loli and cubs. Tulpa, hmm, never heard it called that before. In relation to the concept in the book series His Dark Materials, I've more heard it called a Daemon (not to be confused with demon) or odder people have called them headmates or some declare them as spirit guides or such. But the idea with Tulpa is that they're created by the host, and not always there. Not to mention that other people can not see or touch them as they can with daemon. Daemons would be copying Tulpae actually. This practice has been around in Buddhist Spiritual training for literally thousands of years.